I am best man for the gent in the dress (sat down, with his herd surrounding him). His surname is Herd, which gave me the idea of ‘Herdy’s Herd’ so a quick email to Kirsten and a few weeks later I had signed off the design and the shirts were being printed. Before you know they have been delivered and the excitement is building. We all travelled to Malaga (in Spain) and I waited until ‘the night of the stag’ to reveal both what we all had to wear and what the stag had to wear. 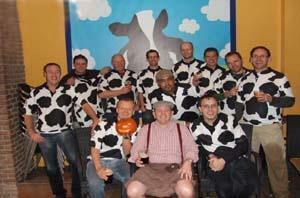 The shirts couldn’t have worked better, and to top it off we found a back drop of a cow inside one of the local pubs!